There are tons of applications out there that are clearly questionable, but they still manage to enter multiple computers worldwide. Take Video Dimmer, for example. 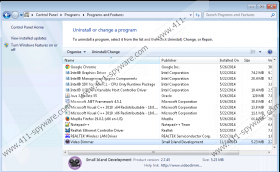 It is a potentially unwanted application that is categorized as an adware program. This means that although Video Dimmer appears to be providing a useful function, this main function is overshadowed by the fact that the program displays commercial advertisements and functions as an adware program. It is obvious that keeping an adware program on your computer is not a good idea, so it would for the best to remove Video Dimmer right now. If you access the main website for Video Dimmer via videodimmertool.com, you will be greeted with a basic yet sleek design and generic information on the plug-in. It says that with Video Dimmer installed on your computer; you can “set the mood and dim the lights” and “enhance your ability to watch videos on the web.” In other words, Video Dimmer should help you emulate a “cinema” feel whenever you watch videos online, but the question is whether such a tool is really necessary when you can simply click the full screen button. There is simply no need to dim your background because you can get rid of it anyway. As one can obviously tell, Video Dimmer is available for download at the main website. However, we assume that the direct download is not the main distribution method applied by this application. Our computer security researchers say that Video Dimmer is similar to Finance Alert, Celebrity Alert, and Health alert adware applications. If that is the case, Video Dimmer does not really need to rely on the direct download distribution. The program clearly gets distributed bundled with freeware applications, and unless you read all the installation wizard’s steps through and through, it is very likely that you had Video Dimmer installed without even realizing. As mentioned above, Video Dimmer functions as an adware application. It does not add any plug-ins or extensions to your browser, but it runs a service (VideoDimmerService.exe) in the system background. Whenever you access a supported website, Video Dimmer may display commercial advertisements that contain unreliable content. The problem is that adware applications are often just tools that distribute corrupted links and other suspicious information. If it were not your intention to have Video Dimmer on your computer, you should get rid of this application immediately. You should also scan your computer with the SpyHunter free scanner to search for other unwanted programs. You are bound to have more than just one adware applications on board, so take all the precaution measures to keep your computer safe. Select Uninstall a program and remove Video Dimmer. Go to Uninstall a program and remove Video Dimmer. 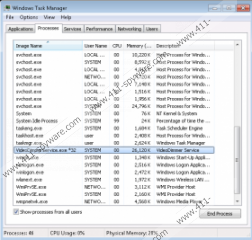 Select Add or remove programs and uninstall Video Dimmer.